My family moved to beautiful Lewes in 2001 from Ghana. Although we were well received and welcomed, and soon became part of the community, little did I know or think of at the time I will be its first ever ethnic minority Mayor. 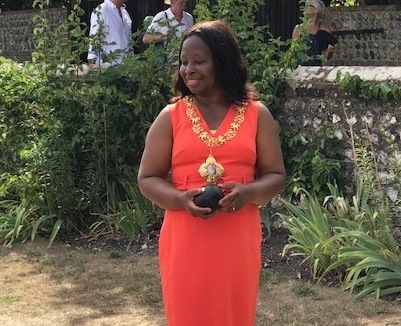 I want to be a new mayor for a new era, creating a fresh environment for all the people of Lewes. I seek to be a mayor for everyone, promote partnership working, equality, and respect. This requires new thinking and new relationships with community groups and businesses to address inequalities and vulnerabilities. I will be providing any support necessary to helping the vulnerable members in our communities, particularly, around economic deprivation. I’m encouraged by the various food banks’ initiatives which help provide food for people who struggle to make ends meet. This is something all of us can agree on, and I would encourage everyone with the best interest of the town to work together with a unity of purpose to support the food banks, so they can continue to help the families in need. Our young people need our support and encouragement to get involved and participate in the civic life of our town. As a policy adviser, and a PhD candidate in International Education and Development, one of my mayoral initiatives will be to involve the youth in practical government at the local level and have a voice in what concerns them. I know the tremendous value of education in this era, and the people far and wide know of Sussex because of our excellent universities. New council arrangements will require new relationships with the university of Brighton and Sussex that provide people with a life time opportunity to study and achieve their goals. Key to this relationship is a renewed regular talks and collaboration between schools in Lewes and these universities which I seek to facilitate. In the municipal year, I have chosen four charities to support. First, I will support the chestnut tree charity which supports and cares for children and young adults from 0-19 years of age with progressive life-shortening conditions. Second, the Sussex prisoner’s families’ charity, which help local families to cope emotionally and practically with the imprisonment of a loved one. Thirdly, the Victoria Hospital and finally, the Prince’s Trust that helps vulnerable young people get their lives on track. It supports 11-30-year olds who are mostly unemployed, and those struggling at school and at risk of exclusion. Many of the people helped by the trust are in or leaving care, facing issues such as homelessness or mental health problems, or have been in trouble with the law. This does not mean that I won’t do my level best to help others as much as I can, and of course, try my hardest to respond positively to every invitation. This is a new era of challenge and opportunity. It is up to us as a town to ensure that what is now exceptional becomes ordinary. I look forward to learning more about residents’ passions and concerns.